The highest possible level of recall – Class 1 – has been issued for a surgical device used in knee replacement operations. Our Boston defective medical product attorneys want to make sure we get the word out. Just because while the device hasn’t been available on the market since last fall, doesn’t mean there isn’t ongoing potential for patients to experience problems with the implanted devices. There is a high probability that a lot of people who have had knee surgery over the last couple of years may be suffering the negative affects of their surgeon using this device during the procedure. The ShapeMatch Cutting Guide is produced by a company called Stryker Corp., which manufactures a host of medical device and equipment. 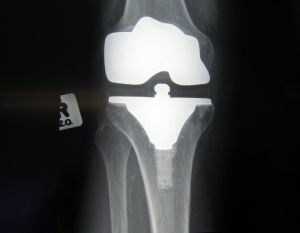 The product in question is a single use cutting guide that surgeons purchase in order to help position the components of a knee replacement operation, formally known as an arthoplasty. It would allow the doctor to guide in the marking of the bone before anything is actually cut. Sometime last fall, the company became aware of a digital defect in the computer software used to make the devices. The firm now says that defect resulted in the displayed depth parameters of cut, angle and resection to be unmatched to the cutting guides that were provided. What that basically means is that a surgeon’s cut would not be as precise as he or she believed. In the end, that has the potential to result in a number of very serious complications. Those would include fractures, joint instability, limitations in mobility, chronic pain, the possible need for revision surgery or all of the above. So in November, the company issued a warning letter to field locations, surgeons who were registered and also imaging centers, advising them to immediately stop using this device in the course of surgery. Then in January, the company issued another letter to these same entities, as well as hospitals, warning them of the problem and ways to potentially mitigate the risks for current patients. However, it wasn’t until April 10 that the company finally issued an Urgent Medical Device Recall. The FDA terms this a Class 1. This designation is reserved for products that are either defective or dangerous that could predictably cause serious health problems or death. It is the highest level of recall. Class 2 and Class 3 recalls are considered less serious. As of this month, the U.S. Food & Drug Administration reports that it has received nearly 45 reports of adverse events, which include at least three injuries and 41 malfunctions. Patients may not even know whether the device was used during the course of their knee surgery, so we would recommend asking your physician. If so, consider contacting our Boston law offices to learn more about your potential rights of recovery. If you have been adversely affected by a defective knee replacement product in Massachusetts, call the Law Offices of Jeffrey S. Glassman for a free and confidential appointment — 1-888-367-2900.